Magicians are a funny lot… We take the NUMBER ONE fear that most people have: Public Speaking, and do it for fun!?! Madness..
How do magicians overcome the fear and nervousness (often called Approach Anxiety) associated with talking to strangers? They use tried and tested techniques to build their self confidence when performing. Here&apos;s 3 quick tips on how to approach strangers that will make a huge difference to your self confidence. It&apos;s best to start small. Don&apos;t jump into the deep end and pick a big crowd to perform too. Performing for a few friends of a couple of trusted family members can be much less scary and help build confidence. Although there are pitfalls to performing magic for family and friends, it can be a start, just to get the confidence that you CAN do it without everything going wrong. Once you have tried that. Try doing some magic to some staff at a local coffee shop, or a shop that you visit often and isn&apos;t too busy. You want to find a very small audience, that will be polite but one step removed from your parents or close friends, so you get used to performing for strangers. When you are used to that, contact a local retirement home, and see if they would like you to visit their day room and perform one afternoon. It&apos;s great experience, does the community good, and you will be very well received.. It&apos;s a great confidence booster and one that worked for me when I was starting out. I know from personal experience how beneficial this can be to a newbie performer&apos;s confidence. 3) Stand up tall and have an open powerful posture. Just before your gig, presentation, or approach to a group, stand up tall, push your shoulders back, and lift your head up! This REALLY works.Do it for a few minutes in private. REALLY DO IT. How you stand and hold yourself creates a chemical reaction in your body that will carry on through to your performance. Smile, think of something funny and give out a laugh.. You are on your own, so nobody will think anything strange about you. Doing this for a few minutes can totally transform how well you come over when you approach people. Try it and see..
Did you find this article useful? Do you have any tips or advice for people on how to approach strangers? If so, please leave a comment in the section below and click the share button so your fellow magicians can discover this article. I asked Scott: What are you struggling with right now? I’m an older guy, but a beginner magician. In my professional life, I present material in front of crowds and run meetings all day long – and fearlessly. But, when it comes to debuting my new little magic trick to friends I am uncharacteristically shy – I can’t bring myself to do it. This failure to perform is affecting my practice, since it’s non-motivating to spend hours on a trick no one will see. This lack of confidence also leads me to over-thinking – is the patter right, what other tricks should I link it to, etc. Just spelling out the problem gives me stuff to think about, but I was touched by your request and thought I’d make myself respond. Scott talks in front of a crowd professionally, and runs meetings all day long… But in those situations he is a different person. He are in a professional role, playing a ‘part’. Many of us become shy doing magic tricks for friends, because they see us differently. We are seen and treated differently by different groups of people… Our friends see through the magician BS.. We are laid bare. Your friends know you don’t really have powers.. They feel comfortable heckling you. Why shouldn’t they? There’s no need for them to play by the same rules that your audience or meeting members have too. Their social norms are different..
All this can throw magicians off their game, and it’s usually why beginners struggle.. The toughest audience is our family and friends. Ironically, that’s the very audience most beginners face first of all. I was actually a very shy kid. I was always doubtful of myself, but one day while I was at a Judo championship, my Dad said to me. “You’ve got to walk in that arena like you’ve already won”. It still took until my teenage years for me to truly understand how that worked, but it helped me win. 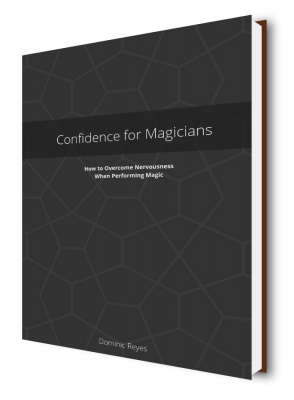 Broadcast confidence when you perform as a magician. I still ride that confidence wave that my parents stood me on. Some would say I’m a show off, and I’d totally agree, but at least I’m a gentlemen about it I guess. I have lots of fellow entertainers ask me if nerves effect me whilst on stage and of course it does, but you need it. Turn those nerves around, You have to be pumped and know you’re the boss, you’re going to own it, and tear that party down. In terms of walking on stage, This brilliant quote sums up what both my parents were telling me, how grateful and lucky I am.